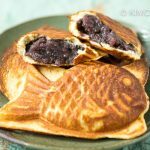 Quick Bungeoppang is my new take on the popular Korean fish-shaped bread that’s filled with sweet fillings like sweet red bean paste and is sold as snacks in the streets of Seoul. 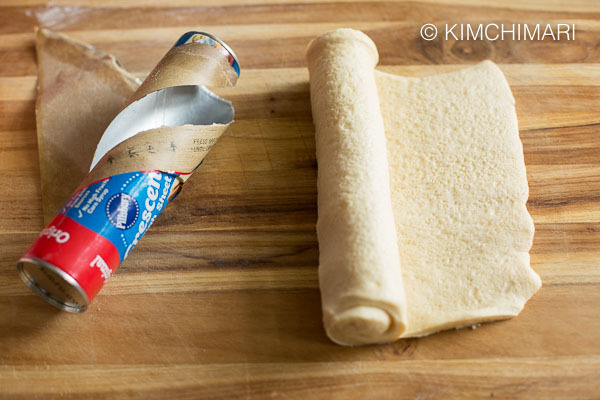 Using the ready-made crescent dough allows you to make it in just 10 minutes while still yielding yummy results. So please TRY IT!! 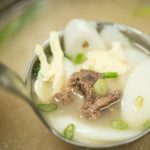 Bungeoppang was always sold on the streets in the winter in Korea when I was growing up. 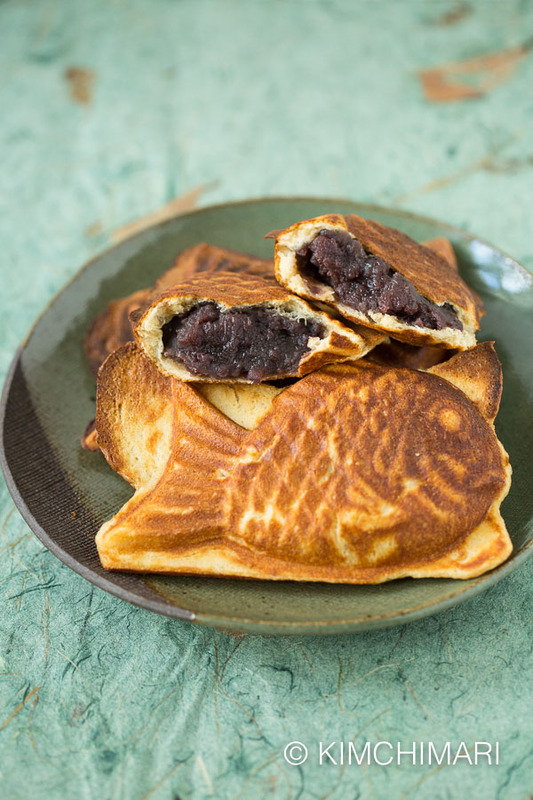 Slightly crispy on the outside and spongy on the inside while the sweet red bean paste (팥앙금 pat ang geum or also called Anko in Japanese) bursts into your mouth as you bite in…yum yum. Anyway, here’s a picture I took of this new type of Bungeoppang made with croissant dough and their shop. I still remember how it tasted – flaky and buttery crust holding the sweet red bean paste in the inside. BTW, I talked to my niece today who lives in Korea and she told me that a lot of these shops have closed now since my last visit. Well, when I ate it, it was sooo goood. I told myself then that I must try to make it when I go back home to the US…fast forward a few years… but you know me, I do get to it sooner or later. 😋 So I decided to try using Pillsbury Crescent Dough sheet to make the Bungeoppang bread. It actually took a few tries to get the portions right. And although it’s not exactly the same because the crescent dough is not as flaky and buttery and multi-layered but it turned out still really delicious in its own way. 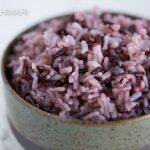 Adjust Dough and Filling Ratio – The recipe below makes a light thin bread with a LOT of sweet red bean paste – which is the way we like it. If you want to make one that has more bread and less filling, just fill up the mold with more dough and less filling. i.e. 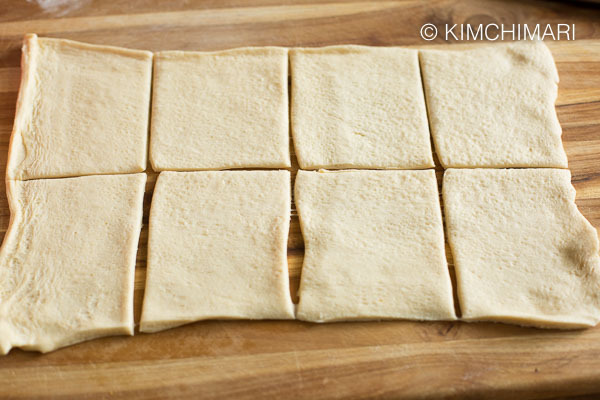 cut dough into 4 or 6 pieces instead of 8. 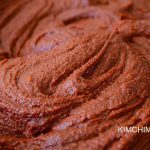 Rough vs Fine Sweet Red Bean paste – there are usually 2 different kinds of sweet red bean paste in the market. The FINE one is a very smooth paste throughout. The other one that is more like CRUSHED which just says ‘sweet red beans’ has more of the red beans intact, giving you more texture. I prefer the Crushed kind for Bungeoppang because I like more texture but it’s entirely up to you. Storage and Reheat – Store leftover pieces in the fridge for a few days. These taste best when it’s freshly made and it’s HOT. Once they get cold, they become pretty hard and not very good. But just reheat in the microwave for 30 seconds for each and they are yummy again! But be careful the red bean filling can be REALLY HOT!! Using Pancake mix or Waffle mix? – I’ve experimented with different kinds of mixes and I share my results in my original Bungeoppang post so please check there. 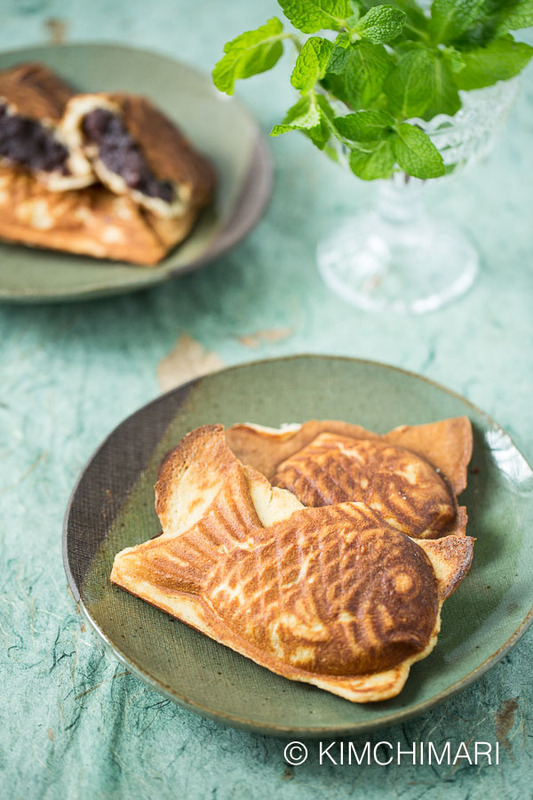 Bungeoppang VS Taiyaki – if you are curious about the difference between the two, I also talk about that in my first home made fish-shaped bread post. 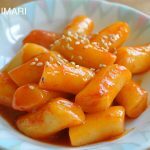 When Koreans see siblings or parent and child who look so much alike, they will say “The parent and child are Bungeoppangs” “엄마하고 애가 붕어빵이야” which means, they look so similar that they look like they were made from the same mold – just like these fish-shaped breads!! HAHAHA I think there’s even a Korean show named ‘Bungeoppang’ where they invite celebrity parent and child in the show and have them play games and quizzes. Pretty cute show! Unwrap the crescent dough sheet on the cutting board. Stretch it out a little to make it more even throughout. Cut the dough into 8 pieces with a knife – like so. 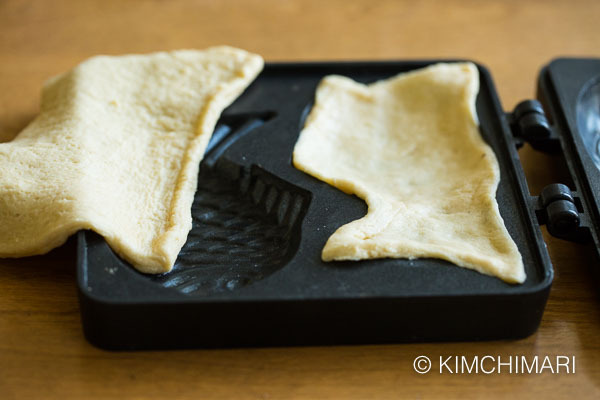 Place a piece of dough into the fish shape mold. Press the mold with your fingers to fill in the shape while making sure there are no air bubbles underneath the dough. 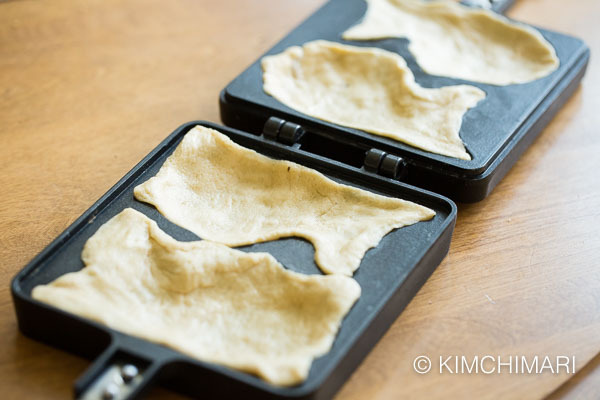 Fill all 8 fish bread molds with dough pieces. 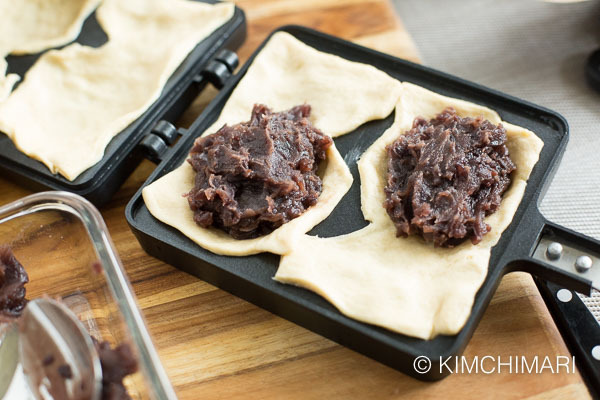 On one side of the mold, fill with sweet red bean paste dough. 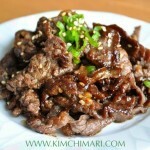 I usually add about 3 Tbs of sweet red bean paste but adjust to your taste. 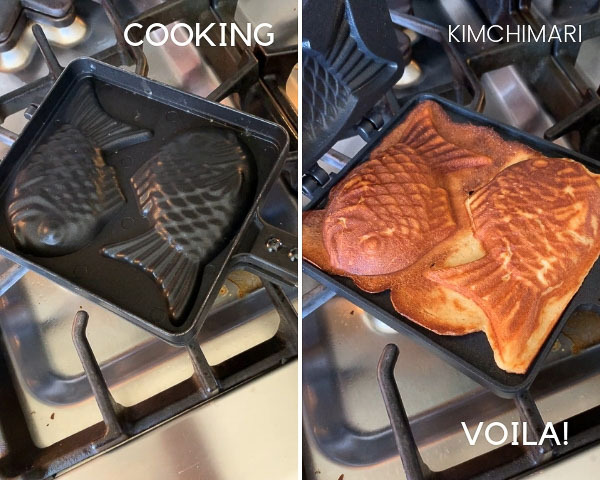 Close the Bungeoppang/Taiyaki pan and take it to your stove top. 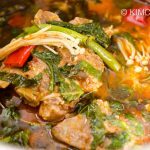 Turn on stove to medium-low (between medium and low) and cook for about 2 minutes to 2:30 minutes. Open the pan after 2 min or so to check the doneness. Leave it until it becomes nice and brown. Quick Bungeoppang cooking in pan then all finished! Turn the pan over and cook another 2 minutes or so until it is also done on the other side – like above. And that’s it!! 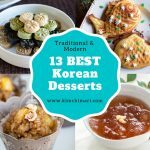 You will have an incredible snack or dessert that’s wonderfully crispy on the outside and a yummy sweet and soft filling on the inside! SERVE when it’s still warm!! Well, I hope you like this quick recipe. 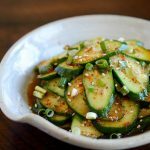 You can also FOLLOW ME on FACEBOOK, PINTEREST, and INSTAGRAM, or join my FACEBOOK GROUP to connect with other Korean food lovers and ask me questions about what you are cooking. 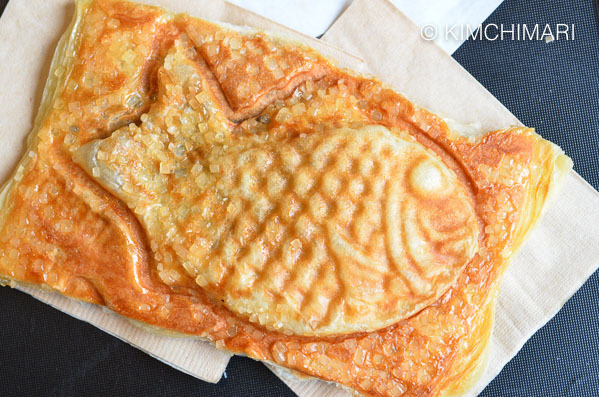 Bungeoppang is a fish-shaped bread that’s filled with sweet fillings like sweet red bean paste and is sold as snacks in the streets of Seoul. Using the ready-made crescent dough allows you to make it in just 10 minutes while still yielding yummy results. 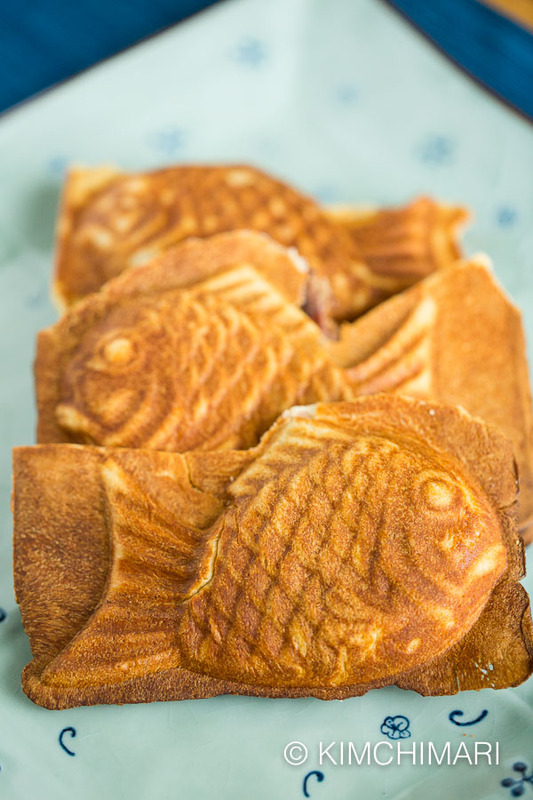 Close up the Bungeoppang/Taiyaki pan and take the mold to your stove top. 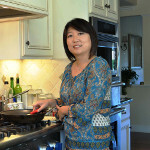 Turn on stove to medium-low (between medium and low) and cook for about 2 minutes to 2:30 minutes. Open the pan after 2 min or so to check the doneness. Leave it until it becomes nice and brown. Turn the pan over and cook another 2 minutes or so until it is also done on that side too like above. 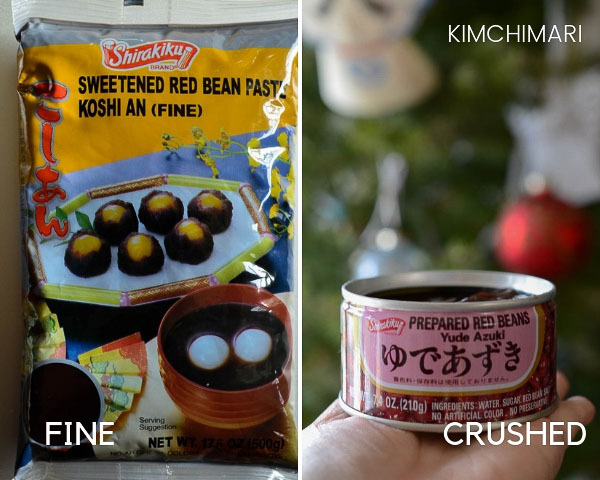 Rough vs Fine Sweet Red Bean paste – The FINE one is a very smooth paste throughout. The other one that is more like CRUSHED which just says ‘sweet red beans’ has more of the red beans intact, giving you more texture. Choose the one that best suits your texture preference. Hi Min! Which comment section are you talking about? You can ask me questions on my facebook page or better yet join my facebook group and you can post questions there! Thank you. 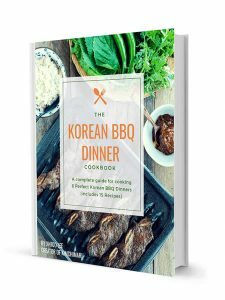 Its was the ssamjang post and other recipes you previously posted.i can’t list them all. I already messaged you on Facebook but no reply yet. 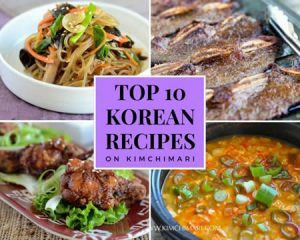 Hi – did u message me on my kimchimari page? Or the group?